Swedish electro-pop band Little Dragon are releasing a new EP, Lover Chanting, on November 9 via Ninja Tune (their first for the album). Previously they shared the EP's title track, "Lover Chanting," which was one of our Songs of the Week. Now they have shared a video for the song. Jack Whiteley and Joe Wills directed the video, which finds the band in a fantasy online role playing game/video game world and was filmed at Allington Castle in Kent, England. Watch it below. Whiteley had this to say about the video in a press release: "We felt there were some strong parallels to draw between the late-'70s disco scene and the world of online role play gaming. Two worlds worshipped for freedom of expression, pure escapism and the ability to redesign yourself in any way you want. This is our attempt at creating a hybrid between those two worlds - a surreal online gaming environment and a heated '70s disco dance-off!" Little Dragon had this to say about the video shoot: "Just an ordinary day in Bodin's castle! Big hugs to director team Jack and Joe and of course all the party people! It was the most splendid day that Kent had seen in years. Sun shining over the rose garden with avatars lined up ready to lose their minds. Come full moon the disco was on. No turning back this time. Unless you level up!" The band issued this previous press release statement about the Lover Chanting EP: "For all the lovers out there, chant along! Dance for peace and unity in this world of madness!" 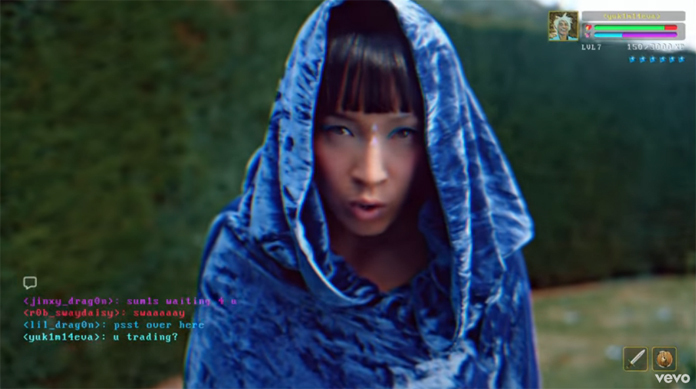 In the previous press release lead singer Yukimi Nagano says that the EP is about "the force of love. Not only between two people but the force of love in this universe as the ultimate ecstasy. Whether that is while you're dancing at a disco forgetting where you are or just staring at the moon on a clear night, it can be anything. A swim in the ocean, a glance at a stranger--it's a personal individual thing. Call it what you want but we have all felt it. So, embrace the great mystery of everything that your brain can't grasp and lose track in the most beautiful sense." In the previous press release, the band further explained the creation of the EP: "It started with Fred searching for a wedding march inspired by a Swedish prog funk folk keyboardist called Merit Hemmingson. Erik got inspired by the track and started singing! After Erik wrote his vocal verses Yukimi got a bit worried about his lyrical abilities and stepped in to add her part on the song. Håkan flew to Germany to record a beautifully tuned clavinet. Once the clavinet was recorded Fred and Erik added their flavor with some drums and deep synth bass."